Egg nog was a popular Colonial Drink. George Washington had his own recipe. Photography courtesy Wisconsin Milk Marketing Board. Egg nog is a descendant of milk-and-wine punches that had long been part of European celebrations when colonists arrived in the Americas. Rum, a New World distillation, enabled a spirited substitution for the wine. Egg nog became a popular wintertime drink throughout Colonial America. Then, as now, people loved the rich, spicy, and alcoholic brew. President George Washington was quite a fan of egg nog. His own recipe, which included rye whiskey, rum and sherry, was reputed to be so stiff a drink that only the most courageous could down it. Brandy joined rum in the basic recipe much later—as part of a book promotion! In the 1820s, Pierce Egan wrote a book called “Life of London: or Days and Nights of Jerry Hawthorne and His Elegant Friend Corinthina Tom.” Just as today’s mixologists and publicists know how to generate buzz with a new cocktail, Egan created a variation of egg nog he called the “Tom and Jerry.” The half ounce of brandy he added to the basic recipe furthered egg nog’s popularity—and fortunately, the original name prevailed. Baltimore initiated a tradition where young men made the rounds of their friends on New Year’s Day, enjoying a bracing cup of egg nog at each home. The more homes one visited, the more “braced” one became. It was considered a feat to actually finish one’s rounds. How times change! Aside from today’s attitudes toward moderation, would anyone give up football to continue the tradition? As with most things in the murky past, there are different stories on the origins of egg nog. The egg part is easy: there are eggs in the recipe (along with sugar, rum, milk, whiskey/bourbon/rum/brandy, heavy cream, vanilla and ground nutmeg). In England and Colonial America, grog* was slang for rum. Thus the description of the beverage, “egg-and-grog,” could be corrupted to egg‘n’grog and then to egg nog. A nog is a small mug or cup. It was used to serve drinks at table in taverns (while drinks beside the fire were served in tankards). 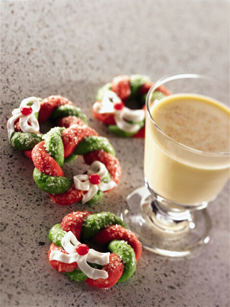 It is much easier to see how an egg-based drink in a noggin would become egg nog. Regardless, the unusual charm of the name only enhances the rich charm of the beverage. Now if we only could do something about those calories! *After Old Grog, the nickname of Edward Vernon (1684-1757), a British admiral who ordered that diluted rum be served to his sailors. The nickname is derived from grogram, after his habit of wearing a grogram cloak—a coarse fabric made of silk, mohair, wool, or a blend of them. Isn’t etymology fascinating? new additions to the Diet Nibbles section. , Inc. All rights reserved. Images are the copyright of their respective owners.